Cup football this weekend on Women’s Football East, from the semi-finals of the Norfolk Women’s County Cup, Thorpe United Ladies v King’s Lynn Town Ladies. 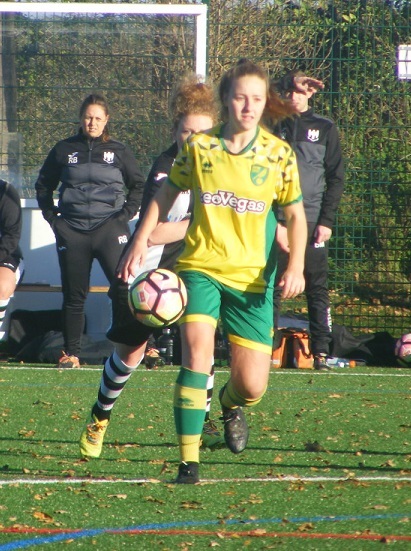 A strong line-up in the last 4 of the competition the prize for the winners huge as the Women’s County Cup Final this season is going to be held at Carrow Road the home of Norwich City FC. A repeat of last season’s final in the other semi-final with ERWFL Premier Division sides Acle United Women and Wymondham Town Ladies going head to head, an extremely tough game to call two strong sides. So to the other semi-final with Thorpe United Ladies twice winners of the County Cup themselves runaway leaders in Norfolk Women’s Division One at home to King’s Lynn Town Ladies playing on the league above ERWFL Division One. A huge incentive for everyone today to get the opportunity to play at Carrow Road, the job might be trying to avoid that distraction and concentrate on the job in hand. Thorpe United Ladies are 15 points clear at the top of the league with just the one defeat in 11 played. The squad a good blend of experience and young talent. 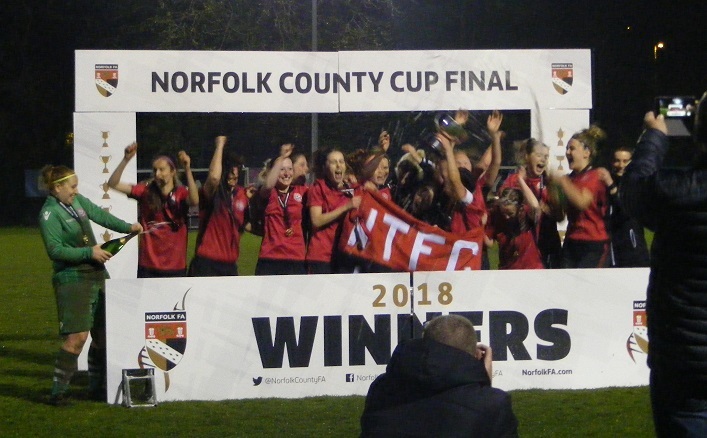 Have enjoyed themselves in the County Cup since it stood alone from Suffolk in the 2013/14 season have reached the final on four consecutive occasions two losses against Norwich City Ladies and then Acle United on penalties before back to back wins against Aylsham Ladies and Wymondham Town Ladies. Last season the exception an early exit to eventual winners Wymondham. A bye in the 1st Round were at home to fellow Division One sides Gorleston Ladies in the 2nd Round 2-2 after extra-time Thorpe won through on penalties. That set up a home tie against another Gorleston side Gorleston Rangers Ladies from Division Two, Thorpe comfortably winning the quarter final game 10-0 to book their place in the last 4 of the competition. 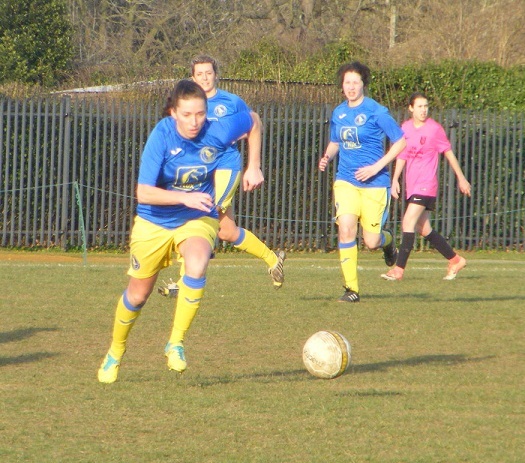 King’s Lynn Town Ladies have never reached the County Cup final. Have risen rapidly through the leagues in their short history. Starting as Lynn Ladies merged with King’s Lynn Town FC, are now into their 2nd season playing in the ERWFL. In mid-table with a bit of a fixture backlog partly due to a their involvement in the County Cup. Began with an away trip to play Norfolk Division One side Sprowston Ladies, a 3-0 win were drawn at home to Dereham side Tavern Ladies in the 2nd Round ran out 6-1 winners to find themselves with another away trip to Sprowston in the quarter finals playing Sprowston Athletic Ladies from Division One that tie twice postponed due to the weather King’s Lynn safely negotiating the tie with a 4-0 win to reach the semi-finals. The venue for today’s semi-final the Thorpe Recreation Ground, a large playing field home to a number of sporting clubs and activities. A number of pitches, a large open space can be bitterly cold if the wind is blowing but today it was much warmer hugely welcome, bright sunshine in a largely blue sky, just a slight breeze could leave the coat in the car for a change. Thorpe United Ladies starting XI – Cara Anderson, Molly Howes, Natasha Leversley, Shannon Miles, Holly Peck, Chloe Young, Joanne Hooper, Laura Hedtke, Aneliese Smith, Molly Yong & Rebekah Lake (C). Subs – Sharnie Boast & Kirstie Andrews. King’s Lynn Town Ladies starting XI – Bryony Robinson, Shanice Burch, Annie Rooks, Charlotte Griffith, Georgia Freeman, Natalie Wright, Becky Russell (C), Jodie Hopkins-Duckhouse, Oksana Imanalijeva, Tiffany Forshaw & Rochelle Woods. Subs – Emma Corbyn, Olivia Baker & Chloe Burch. A depleted starting line-up for Thorpe with a few key players missing, with a couple of injury concerns taking to the field and another having not played for quite a while. King’s Lynn themselves welcome back captain Becky Russell, playing again 9 weeks after giving birth to son Charlie, she played for Thorpe for several seasons too. Norfolk FA supplying 3 officials for the game. Thorpe to get the tie underway kicking off 1st half wearing pink shirts with black shorts and socks. King’s Lynn with blue shirts, yellow shorts and socks. The hosts send the ball up to the right channel goalkeeper Bryony Robinson out of her area to kick the ball clear. King’s Lynn look to build from the back the ball played across the pitch left to right, Natasha Leversley putting in the tackle for Thorpe to win the ball back from Jodie Hopkins-Duckhouse on the right wing for the visitors. The ball won in the centre of the park Russell sends it on through the middle for attacker Rochelle Woods a cushioned headers carrying the ball on into the area she gives chase right of goal, is closed down by Shannon Miles the defender challenging Woods, a corner the result. Hopkins-Duckhouse to take played low into the box near side Russell coming towards in sweeps the ball out of the area towards Natalie Wright position 25 yards out central doesn’t connect with her 1st time shot cleanly the ball hooked wide of goal. Hopkins-Duckhouse lively on the right early on for King’s Lynn picks up the ball tries to drive in field is instead forced wider by Leversley still manages to get a high ball looping into the area dropping far post, goalkeeper Cara Anderson taking it on the bounce despite being clattered by the onrushing Woods. Shaping up to be a good contest from the start, Thorpe aiming to get the ball up for captain Rebekah Lake the forward active across the whole front line making it difficult for one defender keep tabs on her. Wright and Russell combine in the middle slick passing before Russell opens up her body to slide a pass in behind for Hopkins-Duckhouse running in behind, the pass a little heavy allows Anderson to gather inside her area, Thorpe quick to turn the play around Molly Young on the left with the early ball over the top, for Lake the striker after it, Robinson out of her area sharply once again to kick the ball away. Kin’g Lynn with a free-kick on halfway the ball up towards the top of the area into Woods she looks to turn and shoot the effort sliced is intercepted and cleared by Holly Peck. King’s Lynn push on the right a throw won top of the area played into Russell she turns sends the ball in central to Tiffany Forshaw takes on the first time shot the ball spinning away off target. Laura Hedtke pushing on for Thorpe with the ball inside the King’s Lynn half aims to release Lake ahead of her, Georgia Freeman cuts it out for King’s Lynn. Pressure from King’s Lynn in the final third a pass for Hopkins-Duckhouse on the right intercepted by Leversley the ball not away a bit of pinball sees it pop loose central Forshaw 25 yards out running onto it can’t keep her strike down. King’s Lynn have Thorpe pushed back defending their box the ball popping around with not one given anytime on the ball falls to Russell 25 yards out left of the D catches the shot well on the half volley the ball swerving through the air on target favours Anderson as it the goalkeeper ends up right behind it to make the catch. Lake drives forwards on the ball, into the right channel wants to come inside instead is pushed wide by Charlotte Griffith, still manages to get a ball in towards goal the angle against her Robinson getting her gloves on it concedes the corner. Russell is tackled by Joanne Hooper the ball out to Chloe Young right on for Lake her touch giving Annie Rooks the opportunity to slide in take the ball away for a throw. Oksana Imanalijeva on the left for King’s Lynn plays the ball inside for Woods the strike looks to play it on for Hopkins-Duckhouse bursting into the box on the right, Peck and Leversley close her down regain possession for Thorpe. Hedtke is doing well to pick out Lake ahead of her she in turn looking to turn the King’s Lynn defence, Shanice Burch sliding in to win the ball for the visitors. GOAL! Just past the half hour the dead lock is broken, King’s Lynn taking the lead the ball over on the left the in field ball coming to Forshaw 25 yards out seeing it across her body strikes it sweetly the sun at her back the ball flies in towards the top corner over Anderson and into the back of the net 0-1. Thorpe get down the other end a free-kick won outside the area on the left Hedtke over it the deliver long towards the far post area just evades the onrushing attackers. Thorpe make a change with Hooper the player coming off on comes Sharnie Boast. Peck with another piece of smart defending inside the area for Thorpe does well against Hopkins-Duckhouse as Russell plays a great ball to her from halfway. Hedtke in to block wins the ball in the centre circle lifts it on for Lake to attack in behind Robinson is off her line quickly claiming it at the top of the area. Rooks with the ball on for Imanalijeva on the left the Lithuanian international coming inside is tackled by Thorpe’s Molly Howes the defender sliding in to take the ball. Aneliese Smith helps the ball onto to Hedtke in the middle Molly Young to her left the ball knocked into the channel, Freeman intercepts for King’s Lynn. Griffiths then goes in high catching Lake as she threatens to get into the box from the right, a free-kick awarded in a dangerous position, Hedtke on it a bouncing ball in the six yard box skips up for Molly Young far post gets her head to the ball but can only place the ball into Robinson’s gloves. Hopkins-Duckhouse’s first touch sees her push the ball inside evading her marker travels further infield before unleashing a shot 20 yards out swerving through the air Anderson throws herself to her right, the ball just wide of the post. King’s Lynn finishing the 1st half strongly the ball won from a goalkick by Russell played into Woods in the area controls well a touch to shift it to her left and turn into a shot the attempt up over the crossbar. A narrow lead for King’s Lynn at half-time Tiffany Forshaw’s strike the difference between the sides. The visitors creating more in the final third have played well as a unit. Thorpe defending well have been under pressure Lake their outlet up front has lacked support, but is always likely to make something happen. King’s Lynn out onto the pitch early will need another goal you would think, Thorpe with only one defeat this season and that just 1-0 aren’t out of it by any stretch. The sun beginning to set a further problem for the teams to deal with 2nd half. Thorpe to get the 2nd half underway. Right from the off both sides a closing the ball down quickly. Forshaw and Imanalijeva look to link play on the left, Howes defends well for Thorpe. Up the other end Thorpe win a corner on the left off a free-kick the ball cleared back to the taker comes back into the box Robinson taking the dropping ball well under pressure inside her six yard box. The visitors break Imanalijeva on the left wing bursting forwards swings an early cross into the box Woods six yards out central is put under pressure by Miles, the ball dropping to Forshaw at the far post she stabs the ball forwards puts it wide. Good build-up play from King’s Lynn on the right the ball inside to Russell 20 yards out she shoots the strike straight at Anderson the keeper holding onto the ball. A corner to Thorpe on the left the ball played in central met by Leversley she turns it goalwards her effort cleared off the line, King’s Lynn attempt to break a crunching 50/50 on halfway between Miles and Griffith, Thorpe get the free-kick, Hedtke to play the ball forwards Russell winning the header inside the box. Less chances being created 2nd half, Hedtke in a deeper role for Thorpe, King’s Lynn are dealing with Lake better. Russell with the pass forwards for Woods outside the area right of the D turns well shoots the attempt wide across goal. Imanalijeva with a couple of surging runs 2nd half pushes on well down the left in behind sends a cross in along the top of the area is behind Forshaw runs on for Hopkins-Duckhouse taking it into her stride lets fly with a shot the ball wide at the near post. The chances are adding up for King’s Lynn pushing on down the right the ball on for Woods takes it to the byline cuts it back to the top of the area with Imanalijeva running onto the shot can’t keep it down. Forshaw with the ball forwards Imanalijeva the target with a run into the box left of goal six yards out her 1st touch lifting the ball inside over Miles the defender preventing Imanalijeva from shooting. Another change for Thorpe Smith coming off on comes Kirstie Andrews. Imanalijeva seeing alot of the ball now pushes down the left wing cuts it across the top of the area for Woods with her back to goal lays it back to Hopkins-Duckhouse who hits the shot from 20 yards out sees the ball race over the bar. The pressure building from King’s Lynn chances coming and going Thorpe have had little for the attack themselves 2nd half. Working hard concede a corner on the right a good delivery from Hopkins-Duckhouse into the six yard box straight to Forshaw, gets too much power into the shot her hands go to her face as she sends the ball over the bar. Lake has the ball on the left wing drives on gets inside Boast making a run top of the area that side Lake sends the ball across Boast carrying it into the box King’s Lynn defenders slide in Boast it up ended as the challenge comes in the ball just about taken as both defender and Boast need treatment. Play resumes Lake with the ball wide right needs support in the box isn’t there as she gets a cross in. Wright winning the ball left on for Imanalijeva takes it on down the line plays in a cross near post Woods closely marked by Miles manages to get her head on the ball but it drops wide of the mark. Imanalijeva comes off for King’s Lynn on comes Emma Corbyn. Forshaw with Woods pushing on central out to Hopkins-Duckhouse right side she drills a shot in on the angle Anderson pushing it behind at the near post for a corner the game entering the last 10 minutes. King’s Lynn giving away free-kicks, Hedtke on the ball left side plays it in high to the near post Robinson gloves it down claiming it at the 2nd attempt. Burch with a great lunging tackle to take the ball away from Lake as she enters the box almost played through by Hedtke. GOAL! Hedtke wins Thorpe a fee-kick in a dangerous position 25 yards out left of the area. The ball played in towards the goal Robinson clawing it down the ball half cleared out to the left fired back in blocked by the rising Forshaw rebounds back out to the left and is smashed home by Boast to level the scores 1-1. Frustration for King’s Lynn, joy for Thorpe the visitors had their chances weren’t taken and Thorpe level the scores game on with a little over 5 minutes of normal time left to play. King’s Lynn attack from the restart Forshaw on for Corbyn left side her high cross into the area cleared by Peck. A cross from the right side is cleared straight to King’s Lynn’s Wright 25 yards out right of the D meets it well the strike narrowly wide across goal. Griffith with a vital interception for King’s Lynn as the game become stretched in the closing moments, a late change for the visitors Imanalijeva returning for Corbyn on the left. Thorpe with a series of corners late on the 3rd one bringing the 90 minutes to an as we enter extra-time. An entertaining game King’s Lynn had the chances to be out of sight 2nd half but didn’t take them, Thorpe in contrast with a backs to the wall performance finding a levelling goal late in the game. An extra 30 minutes to try and decide the winner or it’ll be settled by penalties. King’s Lynn with the setting sun low in the sky at their backs have kick-off in the 1st period of extra-time. Imanalijeva with the ball left tries to push on but can’t get the better of Boast. Imanalijeva played on by Rooks goes with the early diagonal ball for Hopkins-Duckhouse in the opposite flank, the ball just evading her as she breaks into the box. GOAL! Come from a Thorpe goalkick the ball intercepted by Woods she heads it down right side and drives into the box towards the byline cuts the cross back across the face of goal and finds Forshaw unmarked to rise and header the ball down past Anderson from six yards out 1-2. A positive start to extra-time from King’s Lynn press the attack Hopkins-Duckhouse upended a free-kick to King’s Lynn left side Russell with the diagonal ball into the area, Forshaw gets her head to it with Anderson coming in, the flag up for offside however play halted. Woods gets in behind on the right her cross too long for Imanalijeva coming in far post retrieves and looks to set up Forshaw inside the area her touch lifting the shot over. GOAL! A free-kick defended Griffith carries the ball forwards for King’s Lynn into the Thorpe half sends it on for Hopkins-Duckhouse wide right is pushed wide, holds it up well in the corner gets support from Russell the ball played back to the central midfielder on the wing she swings in a cross that evades Anderson’s glove at her near post Forshaw running in behind with a simple close range tap in to complete her hat-trick and put King’s Lynn further in front 1-3. Griffith goes into the book for a tackle on Molly Young as she tries to take the ball on into the area. A free-kick 25 yards out on the angle left of the box Boast on it goes for goal on target but Robinson behind it gloves the ball down and holds. Wright with the ball on for Hopkins-Duckhouse up the line a low cross driven into the near post area Anderson cuts it out. Woods comes off for King’s Lynn on up front in her place Olivia Baker. Thorpe too with a late switch Hooper comes back on for Andrews. King’s Lynn getting the goals in the 1st half of extra-time with Forshaw completing her hat-trick to lead 3-1. Some much needed daylight alot for Thorpe to do as they get the 2nd period underway. The ball lost in the middle played on for Baker moving right is pushed wide by Leversley the cross comes in lacks power an easy gather for Anderson. GOAL! Thorpe is brought down outside the area as she goes to retrieve the ball fired in from the left. 25 yards out Hedtke over it a good shooting position she takes it on a good strike the ball looping up threatening to drop under the bar, Robinson gets something on it but not enough to keep it out as it falls over the line. Game on once again 2-3. The sun low now light starting to fade King’s Lynn with the lead try to run the clock down taking the ball into the corner Hopkins-Duckhouse holding it up well. Another change for King’s Lynn Forshaw comes off, on in her place Chloe Burch. A free-kick on the right for King’s Lynn taken early by Wright on for Imanalijeva central top of the box Miles stopping her initial effort the ball loose to the right Imanalijeva after it drives a shot against the post it cannons back out into the area before being hooked clear. Hooper tries her luck form all of 35 yards out on the left plenty of power behind her shot, but straight at Robinson covering her near post. Thorpe with a free-kick wide left the delivery into the near post area helped on into the middle Rooks with the no nonsense clearance for King’s Lynn. The visitors press late on Imanalijeva left inside for Baker 20 yards out tries to tee up Russell, she is tackled. Russell regaining possession takes it into the corner the final whistle blows and King’s Lynn are through to their first ever County Cup Final. An entertaining contest going all the way to extra-time, King’s Lynn with a narrow lead at half-time spurned chances in the 2nd half to put the tie to bed, Thorpe with a depleted squad putting in a great effort levelling the scores late in the game to force extra-time. King’s Lynn in the end needed Tiffany Forshaw’s hat-trick her two goals in the 1st period of extra-time crucial. King’s Lynn through to thier first County Cup Final and the first to be held at Carrow Road. Onto today’s Women’s Football East – Player of the Match, and boy this is a tough on was a great all round team performance from King’s Lynn hard to pick one player but one must be chosen those are my rules. Tiffany Forshaw got the all important goals her hat-trick securing King’s Lynn a place in the final. Becky Russell was influential in midfield. Oksana Imanalijeva a threat on the left especially 2nd half. On the right Jodie Hopkins-Duckhouse was a threat all through the game driving on with the ball created opportunities and showed good hold up play to bring others into the game, she is my choice for the award. Was spoilt for choice when selecting a County Cup match this Sunday and it seemed few disappointed. This one no exception. King’s Lynn will face holders Wymondham Town Ladies their game with Acle United Women ending 3-3 and going to penalties Wymondham winning 5-4 in the shootout. An enjoyable afternoon, congratulations to King’s Lynn and my thanks to both teams for their help with the teams always appreciated. 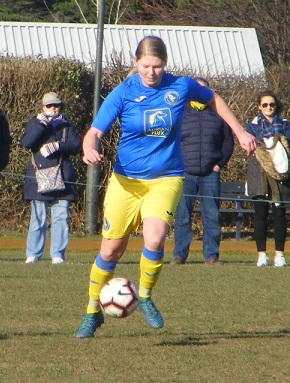 This entry was posted in Match Reports, Norfolk Women's County Cup and tagged Kings Lynn Town Ladies, Match Report, Norfolk Women's County Cup, Thorpe United Ladies on February 17, 2019 by WFEast. The weather played a big part in the fixture list in Norfolk on Sunday with 2 of the 3 scheduled Division Two fixtures called off due to frozen pitches. It was also quarter finals weekend in the Women’s County Cup, 8 sides potentially 2 matches away from a showpiece final at Carrow Road. As it was two of the quarter finals were called off. 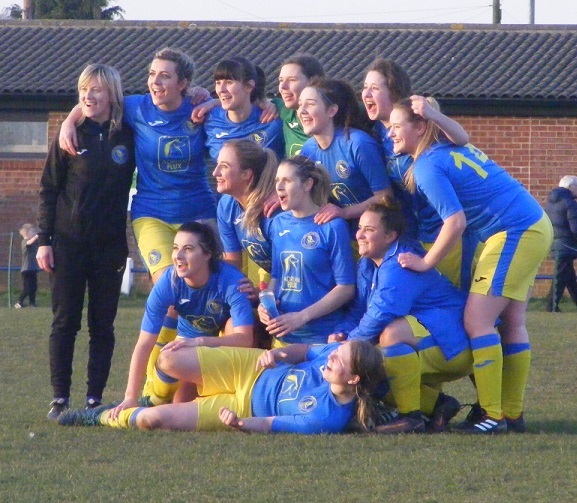 That left two to be played, Thorpe United Ladies have featured in 4 of the previous Norfolk Women’s County Cup Finals including successive wins in the 15/16 & 16/17 finals. A strong lead this season in Norfolk Division one they were the favourites heading into their quarter final tie at home to Division Two side Gorleston Rangers Ladies on Sunday, and so it proved Thorpe comfortable winner in the finish ending with a double figure winning score 10-0 to book there place in the last 4. Wymondham Town Ladies are the current holders of the Norfolk Women’s County Cup winning the trophy for the 1st time last season, would love to get the opportunity to play at Carrow Road and try and win it for a 2nd successive season. 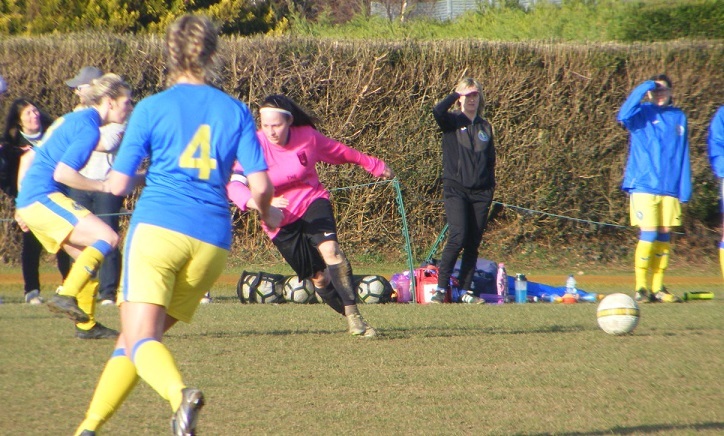 A late switch of venue saw there quarter final tie against Taverham United Women on on Sunday. Taverham’s young side enjoying a great debut season in women’s football unbeaten at the top if Division Two there toughest test yet against Wymondham playing 3 leagues higher in the ERWFL Premier Division. Wymondham have plenty of goalscorers in their side and if they get an early foot hold in a game tend to go on and go big. The ERWFL doing just that with Becca Russell striking from distance to open the scoring in the 7th minute. Just 4 minutes later it was 2-0 Mollie O Callaghan turning in a cross. Jorja Patterson scoring a 3rd goal for Wymondham in the 15th minute. A comfortable platform early in the game it was quiet for the next 15 minutes then on the half hour goals came at regular intervals as Taverham struggled to contain Wymondham’s attack. O’Callaghan with her 2nd of the game making it 4-0. Striker Hannah Waters with a brace along with Russell who claimed her hat-trick in the 45th minute Wymondham leading 8-0 at half-time. Onto the 2nd half Taverham having a tough first half needing a positive start to the 2nd half keeping Wymondham out for the 1st 15 minutes managed to pull a goal back on the hour, not long before Wymondham got a goal however with Chelsea Clarke sending in a rebound to make it 9-1. O’Callaghan completing her hat-trick with 18 minutes left. Laura Nicholls Wymondham’s top scorer popping up with a quick fire brace in final 15 minutes to see Wymondham reach the semi-finals with a 12-1 win. The single league fixture taking place in Norfolk this Sunday was in Division Two with 3rd placed Long Stratton Women winning their 4th successive league game to close the gap to 2nd placed Fakenham to just 2 points. Were at home taking on Thetford Town Ladies. 23 goals for Long Stratton in those previous 3 games took it to 31 from 4 with an 8-0 win on Sunday. Emily Watts finding her form in front of goal scoring 5 at the weekend taking her onto 17 goals for the season with Charlie Head getting herself a hat-trick has 12 goals now. Long Stratton applying some pressure to the leading pair. 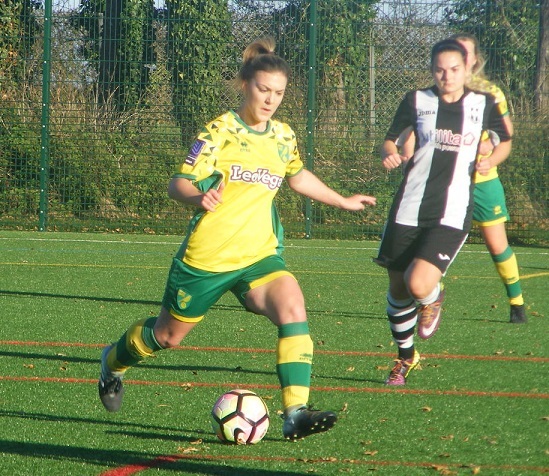 This entry was posted in Norfolk Women's County Cup, Norfolk Women's Division Two, The Round-Up and tagged Norfolk Women's County Cup, Norfolk Women's Division Two, The Round-Up on January 23, 2019 by WFEast. It was County Cup action all the way across the country this weekend and the East was no exception with most competitions at the 2nd Round stage (Essex into the 3rd Round). Plenty of interesting ties out there some games one sides other very close and a just a few upsets. Two of those coming in the Norfolk Women’s County Cup with 7 2nd Round ties taking place on Sunday. Aylsham Ladies receiving a bye straight to the quarter finals. With plenty of games to choose from it was a good decision to settle on a tie early on so it was back to The FDC Flegg for Women’s Football East this Sunday to watch Acle United Women from the ERWFL Premier Division take on high league opponents, Norwich City Ladies stalwarts of the league above the FAWNL South East Division One. 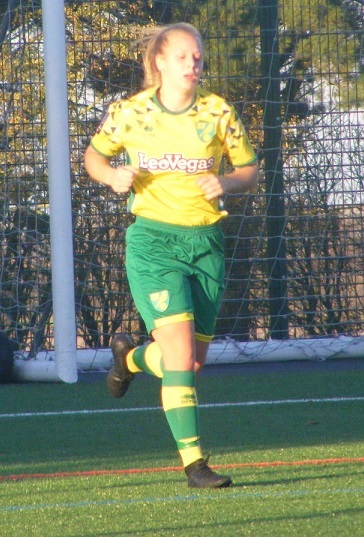 Was treated to a fantastic game of football, Norwich starting well, it was Acle who had the first opportunity on goal, captain Megan Todd through on goal sending the ball wide of goalkeeper Hope Armstrong as she closed her down the ball rolling wide of the post. Norwich going on to get the lead a long range shot palmed down in the box, Natasha Snelling the quickest to the ball putting Norwich 1-0 up. The game ebbed and flowed both sides enjoying spells of pressure Acle getting back on level terms Grace Birchall meeting a Todd cross at the top of the area to send the ball into the bottom corner of the net to make it 1-1. All square at the break. Norwich were temporally reduced to 10 as the County Cup sees the new sin-bin offence applied, Ellie Smith the recipient. That said it was Norwich who retook the lead in this spell, Kathryn Stanley receiving the ball of a throw-in left side turning inside to close on the area a strike a looping shot in from 20 yards out over the keeper and into the goal beyond, 2-1 up. Again Acle pulled the scores level, Birchall a constant threat up front played in from direct play in behind beating the keeper to send the ball home to make it 2-2. The game could have gone either way both sides positive till the end at the death Norwich were attacking Acle countered Birchall peeling away into space closing in on the area shooting her shot deceiving the keeper and running on into the goal to put Acle 3-2. Now time left for Norwich find a reply as Acle reaching the final last season progress into the quarter finals. Wymondham Town Ladies were the side to beat Acle United Women in last seasons final to lift the Norfolk Women’s County Cup for the first time. Awarded an away win in the 1st Round draw were drawn away to Bulldogs Ladies in the 2nd Round a daunting tie to the side currently bottom of Norfolk Women’s Division Two a huge gap between the sides it would have been an easy call to forfeit the match but full credit to the Thetford based side for giving it a go. Wymondham promoted to the ERWFL Premier Division this season have a strong attacking line-up and the goal GIFs were out in force this Sunday.. the dance moves… interesting in themselves. Both strikers Laura Nicholls and Hannah Waters were celebrating first half hat-tricks. Mollie 0’Callaghan getting a brace, whilst Alice Ladbrooke, Chelsea Clarke had a goal each to their name, Waters hitting a 4th as Wymondham reached double figures before half-time. More of the same followed 2nd half, Alice Collins netting a brace. Nicholls scored her 4th of the game. Waters completing a double hat-trick. Captain Rachel Cossey claiming a goal. Rebecca Russell hit the back of the net twice her 1st goals for Wymondham. Clarke getting a 2nd,Leah Newcombe also scoring with O’Callaghan completing her hat-trick at the end as Wymondham ran out 22-0 winners. 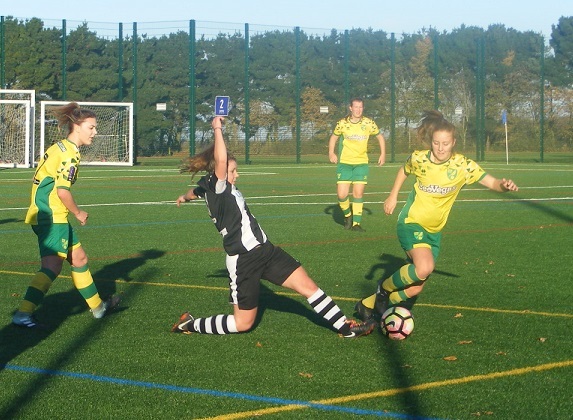 It was also progress in the Norfolk Women’s County Cup for the 3rd ERWFL side competing in the regional leagues for Norfolk, King’s Lynn Town Ladies the Division One side at home to Dereham based side Tavern Ladies in the 2nd Round of the competition. Two leagues between the sides, King’s Lynn started well, Natalie Wright scoring twice as the home side built up a 4-0 half-time lead. Tavern pulling a goal back in the 2nd half with Katie Hart-Copsey on target, King’s Lynn adding two further goals to win the game 6-1. Wright completing her hat-trick, Tiffany Forshaw with 2 goals and one for Rochelle Woods. 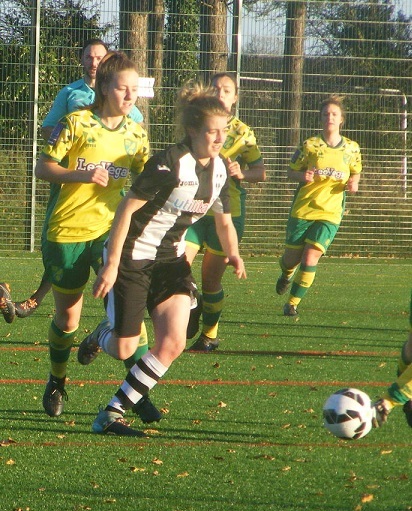 A 100% winning start in the league for Fakenham Town Ladies, at the top of Norfolk Women’s Division Two, they were drawn away in the County Cup 2nd Round to fellow Division Two side, Gorleston Rangers Ladies. A recent 4-1 home win in the league for Fakenham against the same opponents a different story this weekend as Gorleston Rangers got themselves into a 2-0 lead, Fakenham fighting back pulling a goal back through Fanny Dankskanen it wasn’t enough as Gorleston Rangers won 2-1 to see Fakenham suffer defeat for the 1st time this season. Also progressing from Norfolk Women’s Division Two, in the Norfolk Women’s County Cup are Taverham United Women. 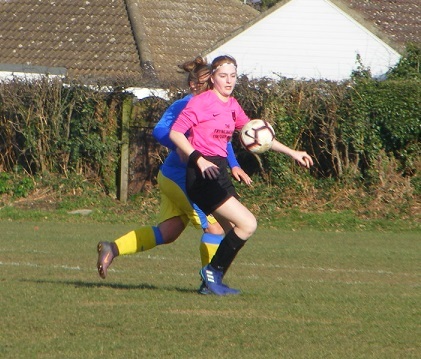 At the top tussling with Fakenham, Taverham too themselves are unbeaten this season new to woman’s football this season, were away to fellow league side Horsford Women in the 2nd Round, reach the quarter finals of the County Cup with a comfortable 9-0 win. 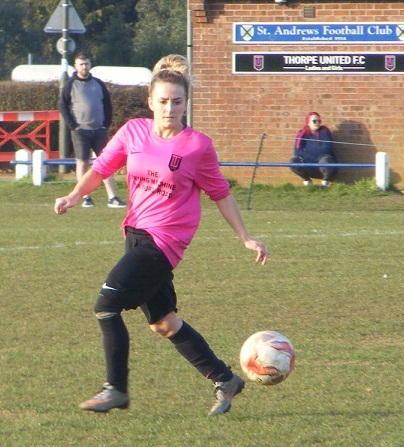 Thorpe United Ladies the current leaders of Norfolk Women’s Division One are two times winners of the Norfolk Women’s County Cup were at home in the 2nd Round of the competition taking on fellow league side Gorleston Ladies. Both side scoring twice in the match the scores were tied at 2-2 after 90 minutes. Into extra-time and neither could find the winning goal to send them through into a penalty shoot out Thorpe edged it 5-4 to advance into the quarter finals. 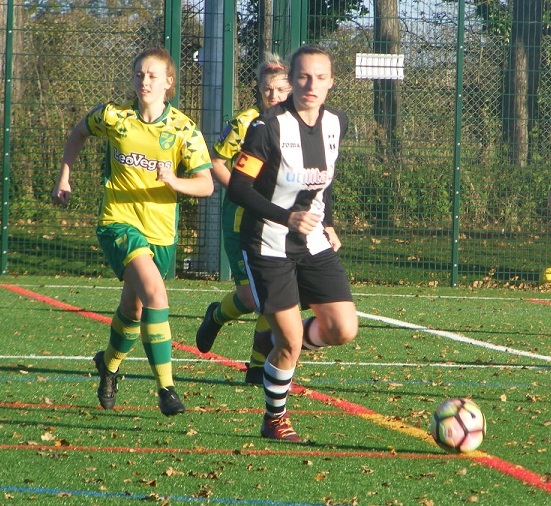 Last but not least Freethorpe Ladies from Norfolk Women’s Division Two were hosting Division One side, Sprowston Athletic Ladies in the 2nd Round of the County Cup. The higher league side finding a winning formula with 3 successive wins in league and cup extended that run to 4 with an away win on Sunday. Laura Jenkins scoring 4 goals in the game her 1st of the season in just her 2nd start. Olivia Leggett was also on target with a goal in a 5-0 win to see Sprowston Athletic Ladies into the quarter finals. An intriguing last 8 it will be interesting to see what the draw throws out. 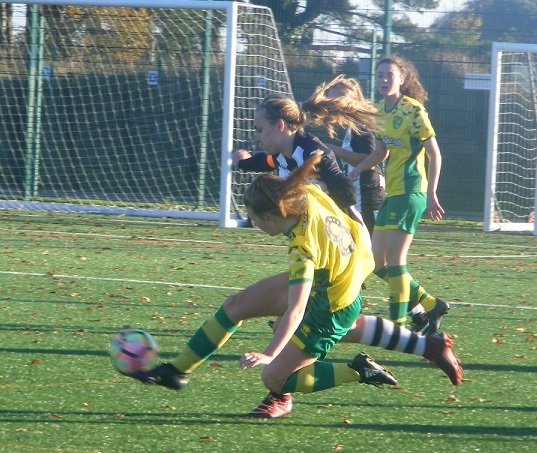 This entry was posted in Norfolk Women's County Cup, The Round-Up and tagged Norfolk Women's County Cup, The Round-Up on November 20, 2018 by WFEast. County Cup action all the way in Norfolk this Sunday with the competition seeing 3 ties played in the 1st Round of the competition. Holders Wymondham Town Ladies going through courtesy of an away win against Bure Valley Wildcats Ladies. Of the 3 ties played it was a high scoring win for Gorleston FC Ladies away to Division Two newcomers Hockering Ladies in the 1st Round. Starting the season well in Division One Gorleston were too strong goalscorers throughout the side the home side losing 15-0 as Gorleston comfortably progress to the 2nd Round. A scare for Division One side, Aylsham ladies in their 1st Round match in the Norfolk Women’s County Cup were away to Division Two newcomers Thetford Town Ladies the hosts taking the lead in the game had further chances to extend the lead before Aylsham found their rhythm going onto to win the tie 6-1 to progress to the 2nd Round. Sophie Lubbock and Hannah Sturman both scoring a brace with a goal apiece too for Amber Mayhew and Vicki Lubbock. 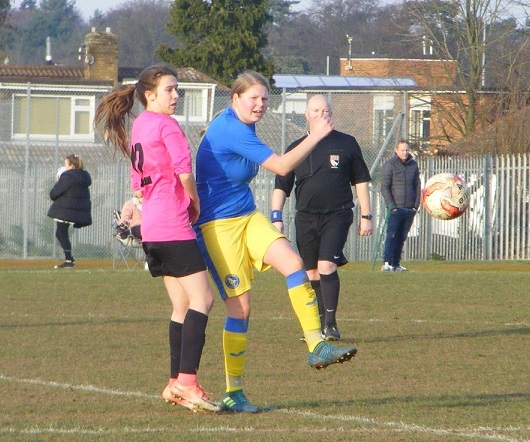 Sprowston Ladies from Norfolk Women’s Division One were playing host to higher league opponents King’s Lynn Town Ladies in the 1st Round of the County Cup this Sunday. The ERWFL Division One side advancing to the 2nd Round courtesy of a 3-0 victory. 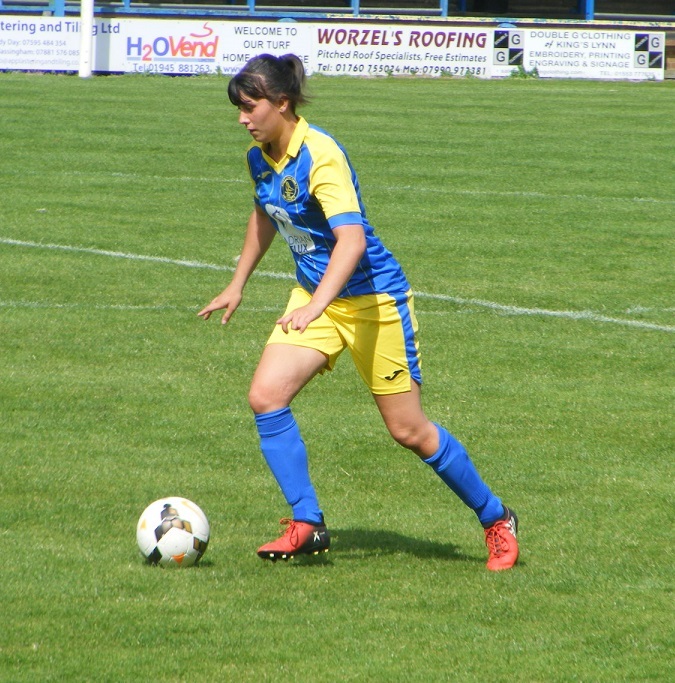 Tiffany Forshaw scoring twice with Rochelle Woods the other goalscorer for King’s Lynn Town. This entry was posted in Norfolk Women's County Cup, The Round-Up and tagged Norfolk Women's County Cup, The Round-Up on October 24, 2018 by WFEast. 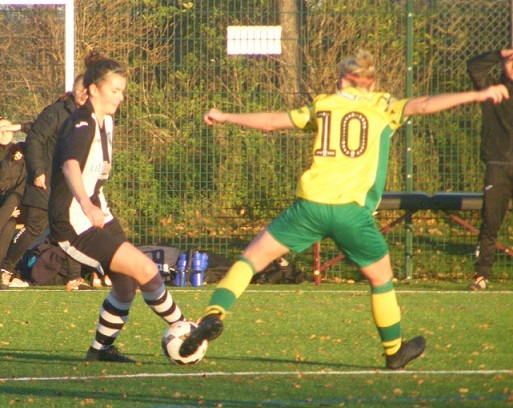 Friday night saw this season’s Final of the Norfolk Women’s County Cup being played at The FDC in Bowthorpe. Sadly the weather wasn’t in on the occasion a wet and miserable evening never the less Women’s Football East was amongst the crowd to watch a contest between to of the best sides in the county ERWFL Premier Division, Acle United Ladies taking on recently crowned ERWFL Division One North Champions, Wymondham Town Ladies into their 2nd successive final. It was Wymondham who opened the scoring in the 1st half from a corner kick the ball put in high towards the near post Bethany Fretwell rising to head it goalwards the ball smashing against the crossbar dropping down into the six yard box Laura Nicholls on the follow up putting the ball over the line. Acle looking for a reply found it on the half hour from a free-kick out wide the delivery into the six yard box Megan Todd going for it past her Kate Pasque close behind bundling it into the back of the net to make it 1-1. Wymondham finding a quick reply awarded a free-kick top of the D up the other end Mollie O’Callaghan’s attempt deflecting up off the wall to loop over the keeper and into the back of the net 2-1 to Wymondham at half-time. Acle came on strong at the start of the 2nd half looking to level the scores for a 2nd time Wymondham’s defensive standing up well to the storm break up the other end Hannah Waters moving with the ball to the left into the area full back Chelsea Clarke with the run inside her receiving the pass and sending the ball past the advancing keeper. Acle continued to press Wymondham keeping them at bay, Acle reduced to 10 as Ciera Flatt was sent off. Naomi Cooper breaking from the back getting into the box scoring from her rebounded effort to pull a goal back in stoppage time not enough to find another as Wymondham win the County Cup for the 1st time in their history. Following up from derailing unbeaten Thorpe United Ladies title hopes in midweek, Bungay Town Ladies score 14 goals in 2 games to move to the top of Norfolk Women’s Division One ahead of Sprowston Ladies on goal difference. A 9-1 win over Thorpe last Wednesday ending the 3rd placed sides unbeaten record. Samantha Walker scoring a hat-trick on Wednesday followed that up with 2 more goals on Sunday to take her onto 27 for the season. 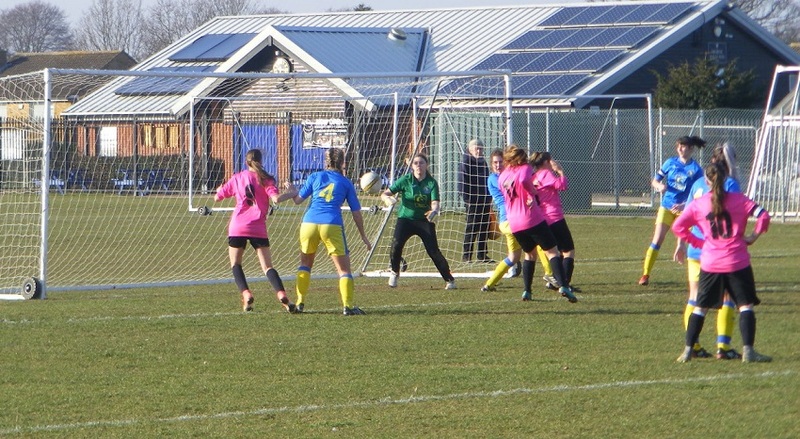 At home to North Walsham Angels Ladies, Bungay were 3-0 up at half-time. North Walsham coming back to score 3 goals in the 2nd half with Lauren Yarham, Luci Middleton and Rachel Bussey on target. Bungay however added two further goals 2nd half to win the game 5-3. As well as Walker’s brace, Nicola Hazell, Emily Leach and Lauren Purling were also on target with a goal each. 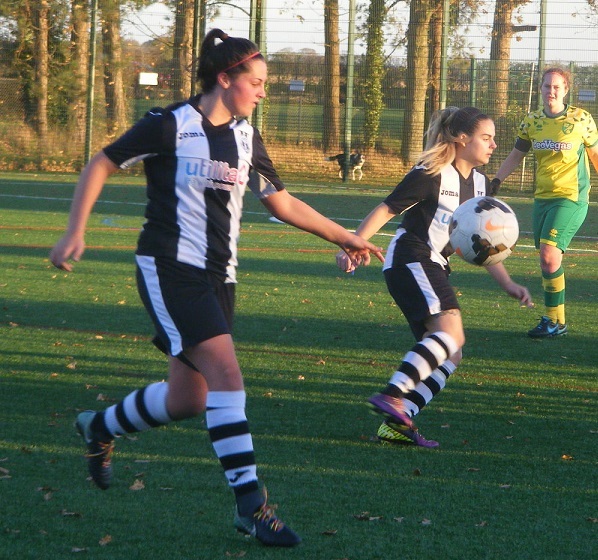 Thorpe United recovered from their midweek loss with a home win against Fakenham Town Ladies on Sunday. Securing the 3 points with a 4-0 win Edie Wright, Leanne Ferdani and Rebekah Lake were amongst the goals. Having lead the table from start to finish FC Sprowston Ladies finally secured the league title in Norfolk Women’s Division Two after they secured an away win and Beccles Town Ladies dropped points at home. Taking on Gorleston Rangers Ladies, Charlie Head scored a brace with Melissa Belsey also getting her name on the scoresheet in a 3-0 victory. Just the one defeat all season for FC Sprowston one more game to play this coming Sunday the League Cup Final at Norwich United’s Plantation Park against Bungay Town Ladies. Beccles Town Ladies finish runners-up in Division Two in their debut season. Were at home to the side they faced away on the opening day in Norfolk Bure Valley Wildcats Ladies, they themselves finishing fourth ending with a good run undefeated in their last 7 matches picking up 5 wins. Ending with a goalless draw against Beccles Town. This entry was posted in Norfolk Women's County Cup, Norfolk Women's Division One, Norfolk Women's Division Two, The Round-Up and tagged Norfolk Women's County Cup, Norfolk Women's Division One, Norfolk Women's Division Two, The Round-Up on May 1, 2018 by WFEast. Cup Final action this Friday from the FDC, Field of Dreams Acle United Ladies v Wymondham Town Ladies in the Norfolk Women’s County Cup. A contest between two sides currently at the top of their game in Norfolk. Both with an ambitious young manager at the helm, Bradley Mingay for Acle United, Alex Guy for Wymondham Town Ladies. Acle United Ladies winners of the Norfolk Women’s County Cup in 2014/15, a currently 3rd in the ERWFL Premier Division, amongst the title challengers games coming thick and fast at the end of the season. Two cup finals to contest the Norfolk Women’s County Cup this evening, have also reached the final of the ERWFL League Cup coming up on Sunday 13th May against AFC Dunstable Ladies. 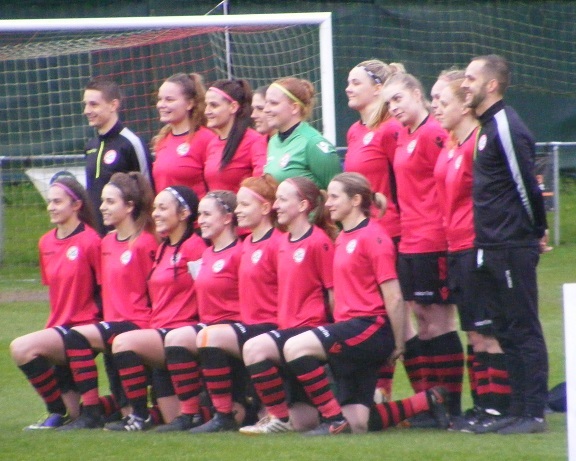 Wymondham Town Ladies are in their 2nd successive Norfolk Women’s County Cup Final and are looking to make it a double this season having already clinched the ERWFL Division One North title and promotion to the ERWFL Premier Division. Are unbeaten in the league drawing just the one of their 17 games so far and with just one game to play will be aiming to go the season without defeat. 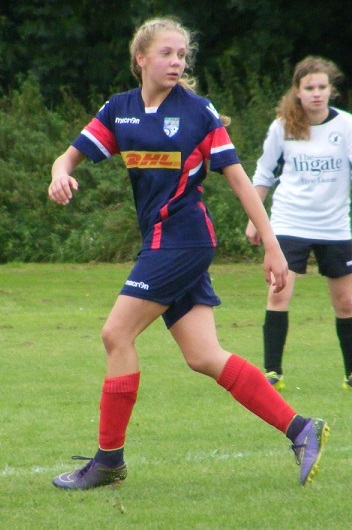 Scoring plenty of goals too Laura Nicholls top scorer with 40 goals this season to date. Hannah Waters joining the club midway through the season making an impact to with 22 goals from 15 appearances. Acle United Ladies received a bye in the 1st Round of the competition, whilst in contrast for Wymondham Town Ladies it was a repeat of last season’s final with a home draw against Thorpe United Ladies a 3-1 win for Wymondham knocking the County Cup holders out at the 1st hurdle. Onto the 2nd Round both Acle and Wymondham drawn away to Norfolk Women’s Division One opposition. Comfortable wins for both Acle putting 7 goals past Gorleston FC Ladies whilst Wymondham scored 8 without reply against Stalham Town Ladies. 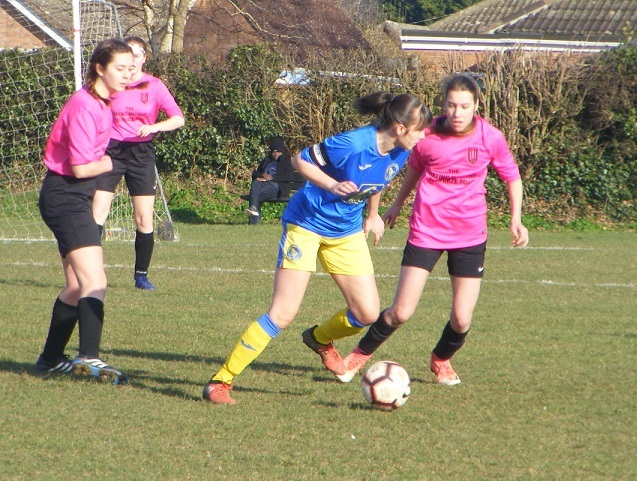 Frustration in the quarter finals for Acle after seeing their tie away to Aylsham Ladies previous County Cup Finalists postponed twice they were eventually awarded the away win to progress to the last 4 of the competition. 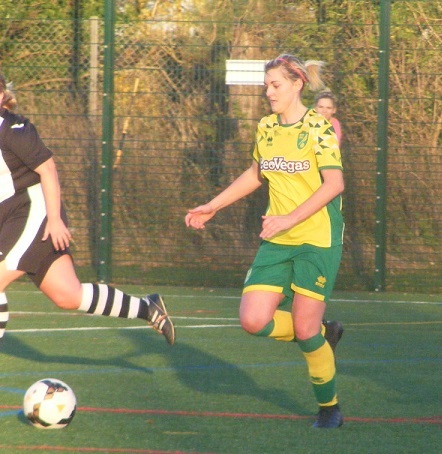 Wymondham were already scoring plenty of goals when they were drawn away to Fakenham Town Ladies a crushing 15-0 win seeing them through to the semi-finals. Acle away to King’s Lynn Town Ladies who had seen off Norwich City Ladies at The Walks, Acle edging the result on the day 2-1 to reach the Final. Wymondham were drawn away aswell in the semi-final taking on Norfolk Women’s Division One leaders Sprowston Ladies. Unbeaten in the league and scoring plenty of goals Wymondham did so again a 7-0 win seeing them into their 2nd successive final. After missing out on the trophy last season Wymondham have added determination to lift it this time around. The venue for this evening’s final The FDC, Field of Dreams in Bowthorpe. Did wonder if we would see a game as the rain had been falling all day and heavy at times on the way there. However Norfolk FA declared the game on a slight concern about one goal mouth by the rain easing slightly. Not much cover beside the ground a small seated stand but despite the miserable conditions a good number had turned out most of the opinion this was going to be a good contest against two good sides. Acle United Ladies starting XI – Cyan Fullbrook, Anna Larkins, Naomi Cooper, Kate Pasque, Chloe Shields, Amber Rowland, Ceira Flatt, Lauren Bullard, Megan Todd (C), Kirstie Kindred & Laura Holden. Subs – Brogan Scully, Erin Wilson, Rhianne Brister, Grace Birchall & Leah McGuire. Wymondham Town Ladies starting XI – Ashleigh O’Callaghan, Leah Newcombe, Chelsea Clarke, Bethany Fretwell, Lauren Kett, Rachel Cossey (C), Alice Ladbrooke, Mollie O’Callaghan, Kayleigh Holloway, Laura Nicholls & Hannah Waters. Subs – Brooklyn Cheal-Ferris, Alice Collins, Jorja Patterson, Rose Glendinning & Louise Hamilton-Rout. 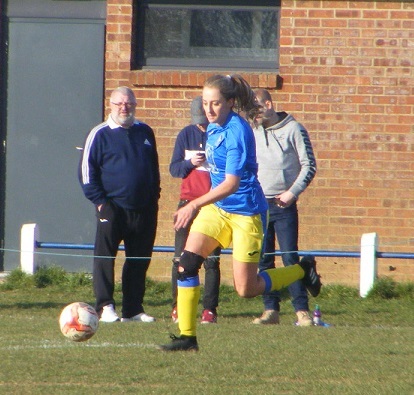 Acle centre back Kate Pasque a doubt before the game having pulled up early in the previous league match away to Royston Town Ladies last Sunday, however coming through the warm-up okay was okay to start. Lauren Kett at the back for Wymondham, starred for Thorpe United in last season’s County Cup Final success. Wymondham to get the first half kicked off wearing red shirts, black shorts and red and black hooped socks. Acle kitted out in white and black vertical striped shirts black shorts with black and white hooped socks. The rain briefly absent. Both sides probing early on the ball knocked back and forth Wymondham play the ball up to Hannah Waters 30 yards out a speculative attempt from distance the ball landing wide of Cyan Fullbrook’s goal. Megan Todd wide on the right likes to get the ball at her feet and drive at players, strong cutting inside Lauren Kett comes across to put in the tackle win the ball at the top of the area. Acle build from the left at the back Naomi Cooper bringing the ball on forwards for Lauren Bullard, Amber Rowland moving across from midfield receiving the ball sends Bullard on in behind her cross put behind at the near post. Close for Acle as the cross bar is struck early in the game a free-kick awarded in the centre of the Wymondham half, Rowland on the ball a good delivery up to the top of the area Todd the target right of the D gets up well, Ceira Flatt with a good run spinning clear of her marker, Todd’s header falling to her running into the six yard box at the far post catches the ball on the volley her strike smashing up against the bar, drops back into play Wymondham getting it clear. GOAL! No sooner have Acle come so close to the opening goal Wymondham get up the other end and score. Winning a corner kick on the left side. The initial delivery in defended by Todd at the near post her header going back to the taker the ball shifted and crossed back in high Bethany Fretwell rising highest 8 yards out to get her head on the ball, Fullbrook jumping gets a glove up toward the ball as it smashed against the crossbar drops straight down into the middle of the six yard box straight to Laura Nicholls sends the ball over the line to put Wymondham into the lead 0-1. Acle are soon on the attack after the restart looking for a quick response Todd with a powerful run with the ball on the right fires a cross in low towards the near post the shot bu Kirstie Kindred into the side netting. Laura Holden see’s the ball come straight to her as goalkeeper Ashleigh O’Callaghan miscue’s her goal kick the ball striking the Acle attacker 25 yards out right of goal she shoots for goal looking to put the ball wide across the keeper too wide the ball runs wide of the far post. Flatt picks up the ball in midfield for Acle takes it on Rowland going with her as she plays the pass out to Bullard getting in behind wide left her cross put back into the middle for Rowland top of the area she brings it inside before unleashing a shot her curling effort rising goes wide of the far post. Wymondham counter quickly the ball put over the top see’s Nicholls running clear in behind, Fullbrook quickly out to the edge of the area to slide in claim the ball at her feet. A good tempo to the game a good sized pitch conditions are tricky but players are keeping their feet well enough as the rain begins to fall once more. Wymondham captain Rachel Cossey is down injured in midfield and cannot continue she is substituted, Jorja Patterson coming on a direct swap. Todd bursts forwards down the right with the ball her low cross in defended Fretwell clearing the ball. Bullard winning a corner on the left as she and Cooper combine well on the left. The ball driven in low towards the near post is deflected into the side netting a goal kick given. A good contest the sides fairly evenly matched the ball played up to Hannah Waters inside the Acle area her knock down back to Kayleigh Holloway on the left her ball back in charged down by Todd. O’Callaghan saves with her legs as Acle attacking down the right send a cross in long across the six yard box Bullard arriving far side with the shot towards goal. Holden and Kindred try to force their way through the Wymondham defence Kindred winning the ball pushes it into Holden she takes t on as Holden tries to get in behind the ball intercepted the deflection taking it away for a corner. The ball attacked near post defended a crowd going for the ball two players down in the aftermath. Wymondham’s Alice Ladbrooke with the pass on to Mollie O’Callaghan left side, Anna Larkins with the challenge to break up the attack. Wymondham regain possession in the middle the ball out to the right the cross swung into the area Kate Pasque up to head it away, Alice Ladbrooke claiming the ball puts it forwards early as Acle look to clear the box, do so as Nicholls breaks clear on goal the offside flag halting her attack. Acle attack Cooper picking up possession on the left allowed to travel comes inside out for Bullard wide left her cross along the top of the area, Kindred meeting it her shot central inside the D played wide of the far post. A substitution for Acle Bullard coming off, Grace Birchall coming on. Rowland is fouled on halfway the free-kick played forwards early Fretwell does well under challenge to get the ball safely back to her keeper. Kindred wins the ball 25 yards out Rowland getting forwards to support her right side the ball passed out to Todd her cross fired in near post, two Acle attackers going for the ball put behind for the goal kick. GOAL! Just over half an hour played and Acle get themselves back on level terms. Awarded a free-kick out on the right players forwards from the back is a very good ball into the six yard box O’Callaghan comes to punch the ball attacked by Todd it goes beyond her Pasque close behind bundles the ball over the line 1-1. GOAL! Wymondham are soon back in front the goal coming from another set-piece a free-kick on half-way the ball played up to the top of the area a push in the back spotted a 2nd free-kick awarded in a dangerous position central right at the top of the D. Mollie O’Callaghan to take, she goes for goal her strike clipping the Acle wall the deflection sending it up and looping over Fullbrook into the back of the net 1-2. Flatt comes forwards her pass on for Todd on the right the ball into the area intercepted deflected back to Todd who strikes it from 25 yards out her effort bouncing wide across goal taking a nick off a Wymondham player on the way through a corner given. Acle press late on in the 1st half winning another corner right side the delivery into Holden good hold up play she turns he cross back in landing on the roof of the net. Kindred spins in behind, Fretwell quick to recover comes back on her to slide in put the ball out for a throw top of the area. Patterson gets hold of the ball for Wymondham sends it forwards for Waters in the area up against Pasque the defender wins the challenge. An entertaining 1st half comes to an end Wymondham holding the narrow advantage could quite easily have been the other way around. Both sides coping with the conditions well are evenly matched and all 3 goals ave come from a set piece. More of the same in the 2nd half and the game could go either way, maybe all the way Acle having been involved in a penalty shootout the last time they were here. Acle to get the 2nd half underway start the 2nd half brightly pressing forwards Rowland passing the ball left to Birchall her early diagonal ball into the area Todd closing in on the far post cant quite reach it. Flatt into Rowland as Acle come again she picks out Holden breaking away to the right her cross screws away behind at the near post. Birchall with the ball comes inside from the left digs a shot out from the edge of the area her strike racing wide across goal past the far post. Acle attacking with purpose at the start of the 2nd half, Holden with the ball 25 out Fretwell steps out of the back line to put in the tackle win the ball. Todd with possession for Acle, Larkins races past her on the overlap drives a cross into the box Kindred has it at her feet looks to turn in behind Kett on top of her the defender winning the tackle. Todd takes the ball one cutting inside past one past two is stopped by Fretwell. Acle make a change Broghan Scully on for Flatt. Clarke intercepting the ball played up the line for Todd on the right. Larkins getting forwards on the right her cross going long Newcombe with the header to get the ball clear for Wymondham. A change for Wymondham Ladbrooke coming off, Brooklyn Cheal=Ferris on. Wymondham have stood firm against the early Acle assault at the start of the 2nd half. Attacking up the other end on the left side Waters cutting inside with the ball is brought down. A little further out this time for O’Callaghan left corner of the area sends the ball in long towards the far post, Todd up to head the ball away to safety. GOAL! Having weathered the storm Wymondham get forwards and score to extend their lead a good run from the back by full back Clarke as the ball won in the middle is spread out to Waters moving into the left channel, Clarke breaking into the box inside her the ball rolled into her sends it wide across the advancing goalkeeper at the top of the six yard box to make it 1-3. Chasing the ball down on the right side Nicholls wins Wymondham a corner kick. The delivery in near post leaves a Wymondham player floored needing treatment. The Acle players rush to the bench to receive instruction. A change made Shields coming off at the back Erin Wilson coming on. Larkins moves inside to support Pasque, Cooper coming over to right back. Mollie O’Callaghan is struggling with injury needs to come off Ladbrooke is sent back on. Birchall plays the ball in from the left looking to put Holden through on goal, O’Callaghan can see the ball safely into her body. Todd with an attack on the right into the box the ball defended by Kett, deflected away. Holden with it on left is tackled by Newcombe top of the area. Holden is fouled by Kett 30 yards out Birchall placing the ball in a central position driving in low strikes the wall, then Clarke is fouled as she races out to clear the ball. Another injury Rowland taking the knock this time is taken off Flatt coming back on. Cheal-Ferris cuts the ball out as Acle look to release Cooper into space on the right. Birchall bringing the ball down strikes it on the half volley form all of 35 yards out her effort not troubling O’Callaghan. Alice Collins comes on for Wymondham in place of Patterson with lass than 10 minutes left to play. Acle push forwards left side the ball into the area defended the deflection coming to Cooper on the right 20 yards out her 1st time shot put wide of goal..
Birchall with the run into the area from the left the ball gets caught in the turf preventing her from striking it early hold’s onto possession taking it to the byline firing a cross in along the six yard box behind Cooper she tries to knock it back inside for Holden can’t find her Fretwell launching the ball up field. Ladbrooke tracking back into the area as Acle break forwards in attack is well placed to put in the block, the ball deflected out of the area Fretwell comes out quickly to clear the threat. A corner for Acle the ball as Holden wins the ball races forwards into the area Ladbrooke back there again to slide in to block put the ball behind. The delivery from the right into the middle Birchall getting to the ball looks to turn in towards goal, is shoved to the floor I’m right in line with it and it looks a clear penalty but the appeals are dismissed play goes on. More bad news for Acle moments later as they are reduced to 10 Flatt shown a red card as she commits a foul in the middle, poor judgement kicking the ball in frustration. Wymondham make a change bringing on Louise Hamilton-Rout in the closing stages for Nicholls. Holloway giving way too Patterson back on. Birchall with run up the left tacked by Newcombe. The game moving into stoppage time 6 minutes added. Birchall fouled wide on the left players come forwards from the back, the delivery in towards the near post O’Callaghan taking it cleanly not distracted by the runners closing her down. GOAL! Acle press forwards looking for a goal attacking right play stretched Birchall and Kett are both down left side inside the six yard box as the defender puts in the challenge, the ball cleared comes back out to Cooper on the right play goes on, Kett struggling to her feet plays Cooper onside as she manages to get across into a central position to block Cooper’s initial strike the rebound coming straight back to her she shifts it inside and buries the ball into the back of the net this time 2-3. Kindred returns to the field for Birchall as Acle have seconds left to try and find another goal. Is frantic out there, there isn’t time however the final whistle blows and Wymondham are triumphant winning the Norfolk Women’s County Cup for the 1st time in their history. A good contest between two strong sides. Wymondham with the narrow advantage at half-time weathering the Acle assault early in the 2nd half breaking away to extend their lead. Defended well on the whole Fretwell and Kett strong in the middle of defence. A late goal for Acle ending up a consolation. A hard game to call before kick-off the result could have gone either way in the finish. Wymondham having a fantastic season wining promotion now league and cup double. One more game to go in the league back in action in less that 48 hours away to Histon Ladies where they will want to end the season unbeaten I am sure. Acle are back in league action too on Sunday a long trip down to Hertfordshire to play Colney Heath Ladies. Have another chance for silverware with the ERWFL League Cup Final yet to come. Several contenders once again for the Women’s Football East – Player of the Match, knew there would be. Megan Todd was excellent for Acle, Alice Ladbrooke strong in the middle for Wymondham as were their centre backs Lauren Kett doing well but like the Norfolk FA’s choice I’m going with Bethany Fretwell a very composed performance throughout the game. Congratulations to Wymondham Town Ladies on there league and cup success. Norfolk FA always put on a good final the staff always helpful and despite the awful weather a good number made the trip. An enjoyable game managed to keep my notepad dry somehow. 3 more finals coming up next week. 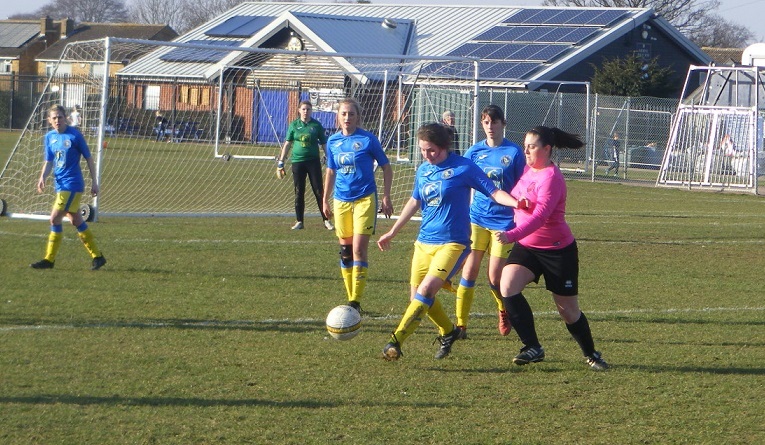 This entry was posted in Cup Final, Match Reports, Norfolk Women's County Cup and tagged Acle United Ladies, Cup Final, Match Report, Norfolk Women's County Cup, Wymondham Town Ladies on April 28, 2018 by WFEast. 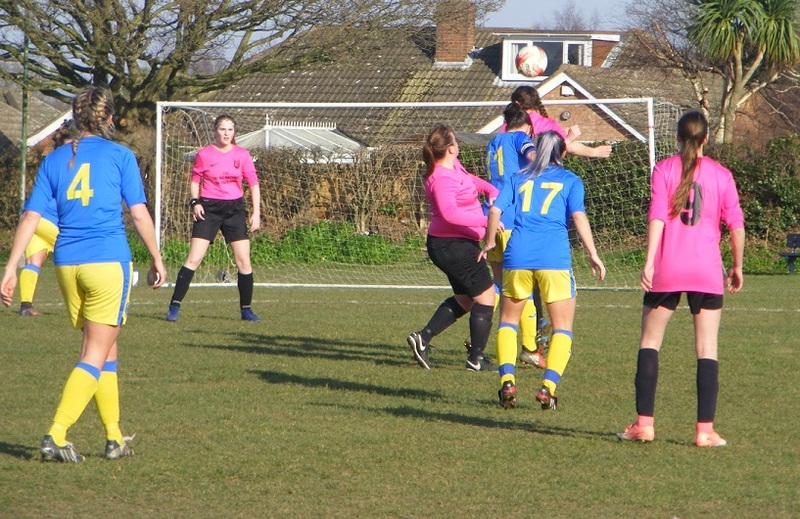 One of countless matches postponed last weekend due to the snow fall King’s Lynn Town Ladies were hosting Acle United Ladies in the semi final of the Norfolk Women’s County Cup. Both sides playing in the ERWFL Division One North and Premier Division respectfully. The winner of the tie going on to face Wymondham Town Ladies in the Final to be played at the FDC on Friday 27th April. Acle United started the match the stronger creating chances as they forced King’s Lynn back into their own half. It was the hosts however who opened the scoring midway through the 1st half the ball put into the back of the net by Oksana Imanalijeva. Acle United coming back into the tie to level the scores just before half-time captain Megan Todd making it 1-1. Acle United started the 2nd half as strongly as they had the 1st creating more opportunities in front of goal finally taking one in the 63rd minute midfielder Laura Holden scoring the goal to put them 2-1 ahead. Defending the lead Acle United had further chances but in the end held on for the 2-1 win to send them into their 3rd County Cup Final. 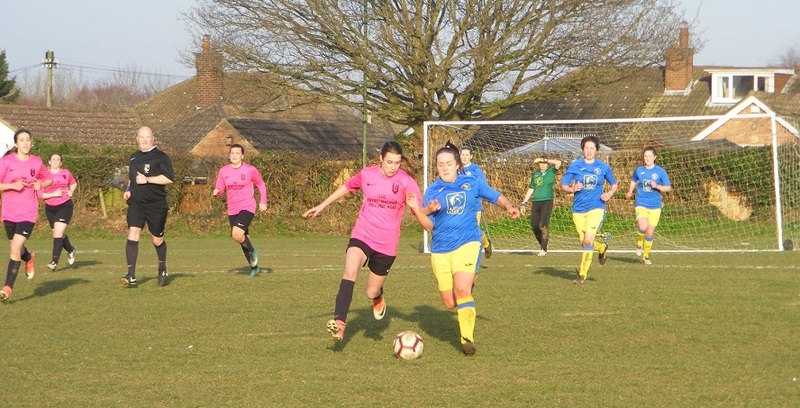 In another game postponed from last weekend it was also semi-final action from the Norfolk Women’s League Cup on Sunday a repeat of last season’s final with Thorpe United Ladies hosting current holders Bungay Town Ladies. The sides sharing a 7 goal thriller in the finish Bungay getting off to a great start were leading the game 3-1 at half-time. 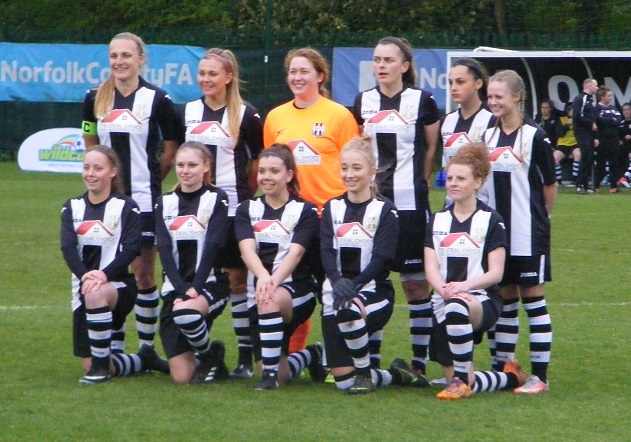 Thorpe United mounted a come back in the 2nd half scoring twice more to level the scores at 3-3 before Bungay came back to win the match 4-3 to reach their 2nd successive league cup final where they will play FC Sprowston Ladies on Sunday 6th May at Norwich United’s Plantation Park. Emily Leach netting twice for Bungay with a goal each for Nicola Hazell and Samantha Walker. Rebekah Lake, Shanice Sutton and Alice Smith on target for Thorpe United. 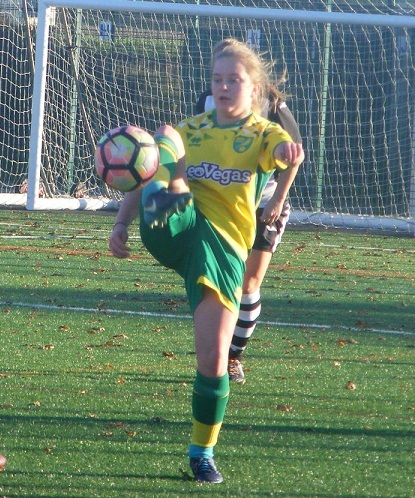 In Norfolk Women’s Division One on Sunday, Emily Watts was making a welcome return to action for bottom side Long Stratton Ladies after over a year out of the game through injury. Jumped straight to the top of their goal scoring charts too as she netted a brace in the game for the side struggling at the bottom of the league. It was opponents Wymondham Town Ladies who came away from Long Stratton with all 3 points however as the scored 5 goals to take them up from 7th to 5th in the league table. 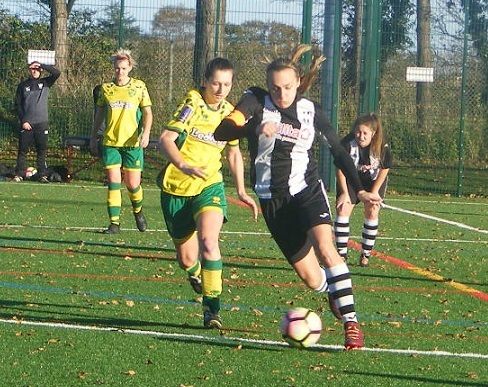 Stalham Town Ladies 4th in the Division One table were at home to North Walsham Angels Ladies in a local derby on Sunday a close game between the side, Stalham edged the result 2-1 to claim all 3 points for their 5th league win of the season. 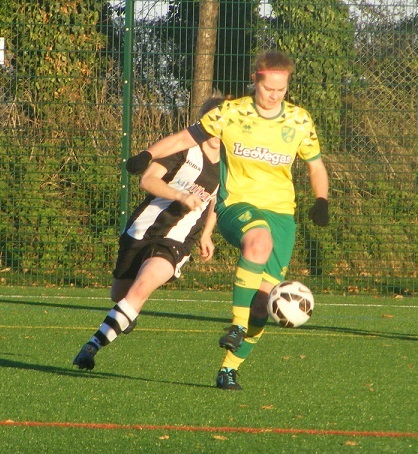 A piece of sad news to bring from Norfolk Women’s Division Two and that is the unfortunate folding of another club in the East, Toftwood United Ladies. A Dereham boy myself growing up it’s sad to hear. The club has struggled for numbers this season however and with the mens club also going it was on the cards. Wishing everyone involved with Toftwood all the best for the future and hope to see everyone continuing in the game somewhere in the future. In Norfolk Women’s Division Two there were two matches played on Sunday. Fair to say it has taken Bure Valley Wildcats Ladies young side a little while to adapt to women’s football but after a tough start to life in the league the side has grown and developed well showing great form as they won their 3rd consecutive league match this Sunday to see the consolidate 4th position in the table. At home to Kirkley & Pakefield FC Ladies a strong 1st half saw Bure Valley Wildcats leading 3-0 at the break before going on to score another 5 in the 2nd half to win 8-0. Charlie Cooper top scoring in the match getting a hat-trick. Kiera Brown netting a brace along with a goal for Emma Macmillan her 1st goal this season, plus an own goal. Another young side getting to grips with life in Division Two are Gorleston Rangers Ladies were away to Freethorpe Ladies on Sunday. A 1-0 win for Gorleston Rangers in the reverse fixture back in December their 1st in the league. Winning last time out earned another point away from home this Sunday Chloe Bailey getting a brace in a 2-2 draw. Freethorpe’s goal coming from Andrea Colbrook and Kiera Squires. This entry was posted in Norfolk Ladies League Cup, Norfolk Women's County Cup, Norfolk Women's Division One, Norfolk Women's Division Two, The Round-Up and tagged Norfolk Ladies League Cup, Norfolk Women's County Cup, Norfolk Women's Division One, Norfolk Women's Division Two, The Round-Up on March 28, 2018 by WFEast.